A sweet and steamy slow burn M/M romance set in Hawaii. This story is a HEA story with NO cliffhangers. Subsequent books in the series will feature new main characters. This is a family focused book that tells the story of the romance between a single dad and the paediatrician who lives three doors down. I enjoyed the glimpses of Hawaiian life in this story and I really liked both Nate and Andrew. Both Nate and An have a whole lot going on in their lives. Nate suddenly finds himself as the single parent to his infant son while An struggles with his homophobic parents, his strict cultural heritage, and the responsibilities he has to his sister and niece. With both men attempting to sort their own lives out, the friendship between them is slow to develop and the romance between them is even slower. Personally, I found this story way too domestic. I’m not a big fan of kids in romance novels and the kids are a constant focus in this one. The characters I did like – An’s work partner and Nate’s sister – feel like side notes. I liked learning about An’s Vietnamese culture and I loved Nate’s sister’s gaymer culture. There are some sweet moments between An and Nate, but I didn’t feel like the over-the-top miscommunication and angst at the end made sense between two quite chilled men. I enjoyed parts of this story, but I think I got distracted by the Hawaii bits on the cover and missed the mention of kids in the blurb. I love a tropical romance, but I probably should have given this single dad romance a miss. Join Crystal's readers group on Facebook for sneak peeks, bonus content, and ARC opportunities or subscribe to her newsletter for monthly book giveaways, recs, news, and more! 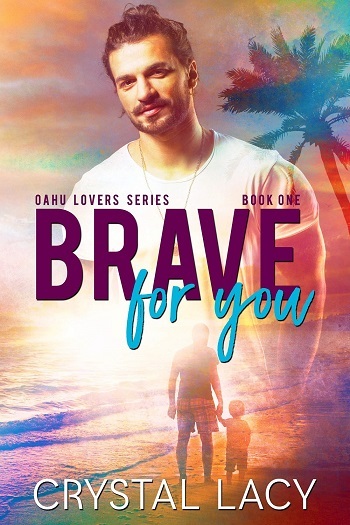 Reviewers on the Wicked Reads Review Team were provided a free copy of Brave for You (Oahu Lovers #1) by Crystal Lacy to read and review for this tour.